If you’re going to install a sauna kit into your home, you will have a number of different options to choose between. Each type of home sauna kit will come with its own pros and cons. Features, benefits, and costs all vary across the board. You may choose to install your DIY prefab modular kit indoors or outdoors. You will receive pre-built sections for the walls. The components that you receive in this kit will be ready to screw/bracket together quickly. With this kit, you are able to quickly install a sturdy, freestanding sauna room either indoors or outdoors. Conclusion: Pre-fabricated modular sauna kits are the best option if you are looking for flexibility. While they may be a little more expensive than complete DIY kits, you will not be locked down to a permanent location. The kit can be disassembled and reassembled in half of a day if necessary. Average price: more affordable than pre-fabricated modular kits, but still pricey. Portability: not portable. Permanent installation. Precut sauna kits convert a current room, closet, shed, or small room into a sauna room. With a precut sauna kit, you will receive custom-cut boards that will line existing walls. You will need to add insulation to the walls to accommodate your new sauna kit. To consider this kit, you will first have to completely measure the walls in the room you want to convert to a sauna. A good tip is that saunas do not need a high ceiling. The smaller the overall space in the sauna, the lower the heating bill. Conclusion: Pre-cut sauna kits are great if you want to convert a small room in your location to a sauna. Keep in mind that installation is much more difficult than with a pre-fabricated modular sauna. Another important consideration is that you will be purchasing custom boards that will fit your room of choice. 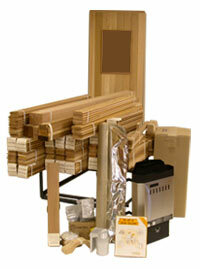 You will not be able to uninstall and reinstall this sauna kit to another location. Average price: Sauna tents are generally inexpensive, but complete sauna cabinets are generally expensive. Portability: Sauna tents are light and very portable. Sauna cabinets are very bulky and heavy but they can be moved if necessary. Sauna tents and cabinets are small, portable units that offer the most convenience and accessibility. These kits are perfect if you have a small home or condo and want to add the luxury of a sauna. Infrared sauna tents are the simplest sauna kits available today. Sauna tents do not get as hot as traditional saunas (they only get up to a maximum of 130 degrees Fahrenheit). You can only fit one person in a sauna tent. 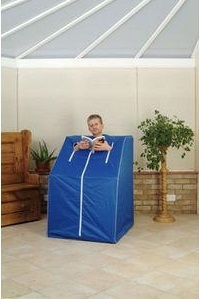 Sauna tents are the cheapest option available for adding a sauna to your home. A sauna tent is a wooden frame that is wrapped with a canvas that contains the heat and light coming from the infrared light heaters. Conclusion: Infrared sauna tents are perfect if you are an individual user looking for the luxury of a sauna in your home. A big thing to keep in mind is that sauna tents do not get as hot as traditional saunas. Sauna tents are perfect if you do not have enough room to install a sauna cabinet, precut, or prefab sauna kit. It is also the cheapest option available. 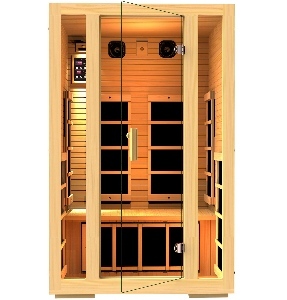 An infrared sauna cabinets are complete sauna kits that fit between 2-4 people. Sauna cabinets are the easiest to install, and require the least amount of time to get up and running. The unit is very heavy, though, so portability is limited by what you can handle. Conclusion: Sauna cabinets are great if you want a plug-n-play sauna kit for your home. You will not have to do any construction or DIY work. Most sauna cabinet kits are comprised of 2-4 main pieces, making for a simple and quick installation. This is the most expensive option out of any sauna kit. Traditional saunas produce heat through heated air, steam or conduction with hot wood. Infrared saunas are a bit different. They get their heat by mimicking part of the sun’s invisible spectrum. This sauna is the number one top selling infrared sauna on Amazon.com. 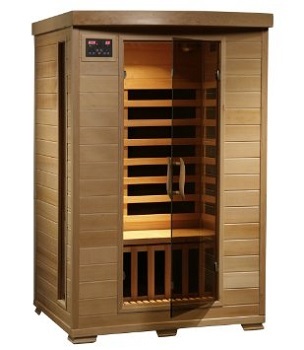 This sauna is equipped with seven of the newest technology, highest quality Carbon Fiber Far Infrared Heaters. Heaters are brand new technology. Located at the back, each side, and near the calf areas in order to maximize the heat distribution. Made with top quality Canadian Hemlock Wood. No chemicals added. Structure is made with Tongue and Groove construction making for a stronger structure. Door made of high quality safety glass made for withstanding high temperatures from inside of the cabin. Patented structure design requires ZERO use of tools. Panels buckle together and break back down easily if need be. High quality sound system made up of two speakers and an amplifier that allows play via AUX cable. Luxurious long lasting LED lighting. Digitally control temperature and length of time you will be using the sauna. 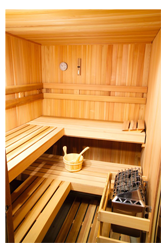 Radiant Saunas provides a very effective solution for those looking to add an infrared sauna to their life. 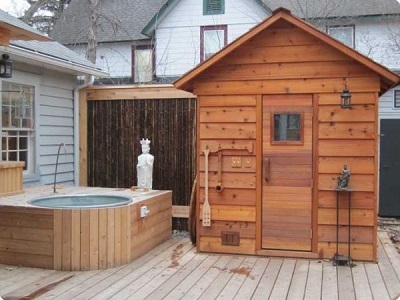 The price tag comes with a sigh of relief when you think about all of the great features this saunas has. Six carbon heaters work together to provide 1725 watts of heating power. Unit made of solid, high quality hemlock wood. Buckle assemblies make for a quick, easy installation. Can work up to 141 degrees Fahrenheit. Radiant Saunas ensures that their infrared saunas put out wavelengths between 5 and 12 microns for the most possible benefit to the human body. LED control panels on the interior and exterior. EZ touch dial operation. High quality tinted and tempered glass door. Included accessories: exterior light, therapy light, air vents, magazine rack, two backrests, tinted glass piece. An outdoor sauna is a great way to add spice to your backyard. You can use a sauna as your own personal meditation space or you can use it as a method of entertainment for your friends and family. The availability of sauna kits has made it possible for the average person to install their own sauna outside of their home. There are a few very important steps that you should take in order to make sure that your outdoor sauna kit installation goes smoothly and as planned. Capture a brand new outdoor experience with a new sauna. 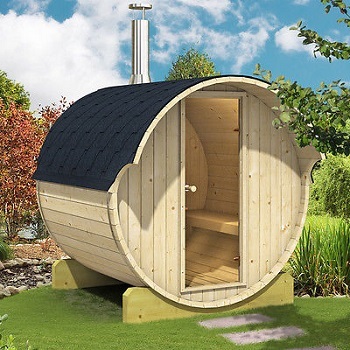 Let’s take a look at a couple popular options for outdoor sauna kits. Cedarbrook offers outdoor sauna kits with prebuilt panels, door, roof, heater, proper rocks, benches, and accessories. You can choose from a wide range of shapes and sizes. Anywhere from 4’ by 4’ up to 8’ by 8’. All Cedarbrook outdoor saunas are made up of 100% Western Red Cedar. Never plywood or pressboard. More room available. Cedarbrook measures their saunas in FULL. No gimmicks. Includes pre-built panels made up of Western Red Cedar. Walls and ceiling formed with Tongue and Groove technology. Benches are pre-built commercial style. Adjustable venting system helps keep the temperature steady, conserves energy, and provides the user with a fresh oxygen supply constantly. The Allwood Nordic Spruce Barrel Sauna is a high-quality Finnish product that can comfortably seat four people. The barrel shape provides a more evenly heated environment inside of the sauna. Install this sauna outside of your home and relax any time you want to in a luxurious setting. Kit includes materials made of: Nordic spruce, bitumen shingles, and stainless steel. Includes electric heater, control panel, complete wiring kit with instructions, guard for the heater, and metal/glass components necessary for installation. Allow thirty to forty days for delivery if you are considering purchasing this unit. A pre-cut sauna kit or sauna material package enables the do it yourselfer to do most of the sauna building themselves. It takes just a few days to completely build a sauna with a do it yourself kit. You don’t even need to be a sauna contractor to get it done. These pre-cut sauna kits supply the sauna materials necessary to complete your entire sauna building project. A pre-cut sauna kit will give you the exact same outcome as a pre-built sauna kit would give you. It will just take some manual labor and handyman skill. 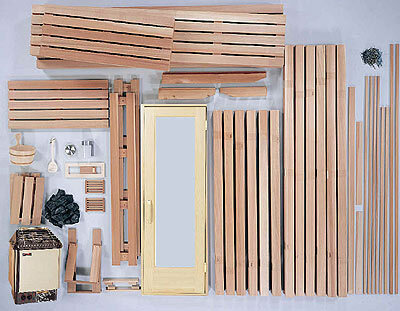 Once you spend the necessary time to put everything together, you’ll be able to enjoy your new outdoor sauna. 16 to 24 hours of total labor should be set aside to complete the installation of your DIY outdoor sauna kit. You may need to trim and assemble the sauna benches, floor boards and T&G wall boards as needed. First, you will need to make sure that you have any necessary permits required by your city to put a sauna outside of your home. Some towns will have certain restrictions on the size, location, and type of sauna that you are installing at your home. You have to select a location that makes sense because you will need to lay out a foundation for your sauna kit. This may involve installing pavers, a concrete slab, or a wooden deck base. Before you start building your personal outdoor sauna, draw a line on the floor where you can assemble it to obtain a better understanding of how your sauna is going to look once you’ve finished installing the pre-cut outdoor sauna kit. Once you’ve drawn the line on the ground, make sure that the spot you have chosen is a spot that is able to be leveled off properly so that the sauna will be able to drain and sit level. You will also have to make sure that the location that you choose allows you to access a 240V electricity supply. The electrical supply hookup is usually the same as the one that you would connect your electric stove or dryer to. Foundation Flooring – If you were installing an indoor sauna, it would possible to use the current concrete floor that is the foundation for your home. For outdoor saunas, however, you’ll need to create a concrete base that is properly poured to account for drainage. Duckboard Flooring – The flooring sections will permit simple installation of the duckboard flooring as well as for future cleaning. You may also install plastic mats or ceramic tile on the concrete floor of your sauna. Floor Drain – Installing a floor drain can be pricey and complicated. Although modest levels of water will evaporate quickly from a sauna floor, caution should be taken in saunas with no floor drain as to never pour excessive levels of water over the sauna heater all at once. You can easily build the stud framework for your outdoor sauna right on the ground outside of the sauna base. 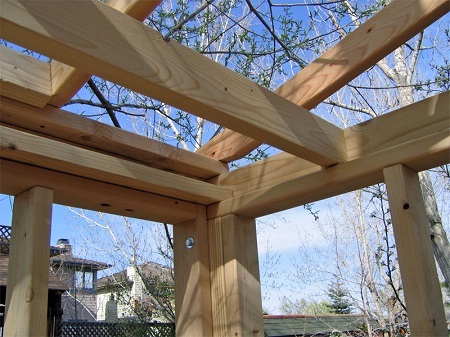 Every outdoor sauna will need a wall frame built around the base. Once you’re done building the wall framing, you will have to lift and attach the wall segments and attach them to the concrete base (or base of choice) with concrete screws and anchor bolts (or proper fasteners for your base). 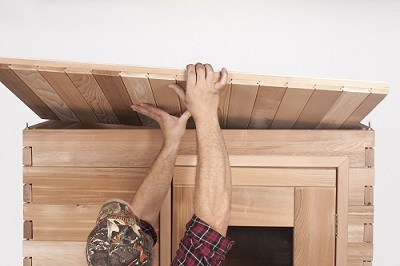 A fall ceiling, framed with 2″x4″ spaced every 16″ is subsequently added. The sauna ceiling height ‘ must not be surpassed. A sauna height greater than 84″ will demand a bigger sauna heater so that you can warm the space above the 84″. The heat which will grow to fill the space above 84″ is going to be a significant inefficiency in the sauna heating system. These are five of the main things that you need to focus on when you are installing an outdoor sauna kit. The rest will require specific instructions that are unique to the sauna kit that you choose. We also have a tutorial on how to properly build a sauna, you can check it out by clicking here. When you are deciding what type of sauna you are going to install in your home, you will have to make the decision whether you want a dry sauna or a wet sauna. Each one works differently than the other but they both have similar benefits. Here we will take a look at a dry sauna versus a wet sauna because you will want to know both sides in order to make a decision on which one you will purchase. Saunas either use a wood burning stove or an electric stove. Each one of these can be used to create a wet or a dry sauna experiance. You will find a way to command this by altering the humidity inside the sauna. Saunas today typically utilize a heating device in addition to volcanic rock. In both instances, the rocks are heated to a high temperature. The main difference between a dry and wet sauna is the water that is splashed over the rocks in a sauna that’s not dry. The water vaporizes very rapidly causing steam because the rocks are heated to this extreme temperature. In a sauna that is dry, there is no water, merely heated rocks. You sweat when you are sitting inside of a wet sauna. In return this causes unwanted toxins to depart from your body. It is also believed that many viruses cannot live in the high heat and that one’s chances of getting sick will reduce with regular use of a sauna. Dry saunas are considered to relieve anxiety and stress, stimulate blood circulation, and help rejuvenate the skin. As having a wet sauna, using a dry sauna will cause sweating to happen, hence invoking a number the same benefits of using a wet sauna. In a dry sauna, the heat is far more tolerable, as the heat is reaching it quickly and precisely thereby generating results more quickly. When humidity exists, the body is cooled and toxins leave in much exactly the same manner as with a dry sauna because the body sweats. It’s believed, however, that it is smarter to use a dry sauna and reap the benefits for longer because of its tolerability. Whether you select to use a wet or dry sauna, make sure that you are aware of benefits and all risks that could be connected with owning it. It’s important to follow all directions and utilize it correctly. By doing so, you can stay more knowledgeable in the process and will receive more enjoyment. The Laatu LPB-68 is a traditional dry sauna that seats five to seven people comfortably. LMR-80 Polar Heater complete with built in controls comes standard, upgrades available. Two headrests above the upper benches. 1” by 4” (1/2” thick) T & G Western Red Cedar. Assembled fully with Western Red Cedar wood. Duckboard flooring for the entire walking area. Pre hung, bronze, tinted door made out of high quality glass. Main wall includes nice light valence. Ships in four to five weeks. 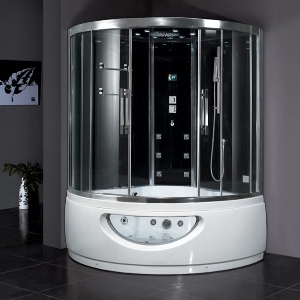 Adding a steam room to your home could be a life changing experience. There are a number of different types of saunas out there but the main two things that you will have to choose between are dry versus wet. Dry saunas produce heat with no humidity, whereas wet saunas will have steam and humidity in the air. If you are installing a new sauna/steam room to your house, it’ll be important for you to understand the difference between the two. Traditionally, saunas are used in order to offer dry heat. In most saunas you are able to enhance the heat by pouring water over hot rocks. This results in humidity levels between 5 and 20 percent. Steam rooms are rather different, though. They are not as hot as traditional saunas. You will also notice that there is water dripping down the side walls due to the high humidity. Because of the high humidity, they need to be constructed of tile, marble or acrylic. All of the fixtures should be made from stainless steel, brass, plastic or other rustproof material. Seats and the ceiling should be sloped, or so the water will run off, and there has to be a drain in the room, which must not leak water or steam into the area that was exterior. The steam generator is located outside the steam room, nearby, and demands plumbing in the water supply (rather hot water) and from your generator to the steam room, as well as electrical wiring to the generator. Instantly update your home with a beautiful new steam shower. This particular steam shower measures in at 63” by 63” by 89”. 3KW generator to power the steam sauna. Allows for two person simultaneous use. Very roomy interior. Ten total hydro massage jets. Two total rainfall shower heads. Body massager with acupressure technology. Sophisticated computer control panel with temperature sensor and timer. Completely transform how your bathroom works for you by installing this relaxing steam sauna shower kit. This sophisticated, high-quality steam shower is built to hold in the heat. A brand new, state of the art generator bakes you while you breathe in the steam produced by your new steam shower. Black acrylic base reinforced by fiberglass ready to use in unison with any standard compression drain. Available in left and right corner-mount installation. Beautiful brushed finish on the stainless steel shower panel. Six different adjustable steam jets. Also includes a hand shower attachment. Three separate water control devices.